On July 22, the New York State Wage Board, commissioned by Governor Andrew Cuomo to consider whether or not to raise the minimum wage for employees of fast food chain restaurants, recommended that these workers receive a phased-in $15 an hour minimum wage. The decision, which will affect an estimated 180,000 employees across the state, was celebrated by workers and minimum wage activists who compared it to the historic minimum wage victories in Seattle, San Francisco and Los Angeles. The first breakthrough for the $15 minimum wage struggle on the East Coast, this decision is especially sweet since it comes in the very same state where the fast food workers strikes for “15 and a union” began in 2012. It is also the first statewide increase to $15 (although for only a section of workers) anywhere in the country. No doubt this decision will act to spur other groups of low paid workers in New York State and beyond to demand the same increase and could therefore open up a new phase of the struggle. The wage board decision, which is likely to be approved by the New York state labor commissioner, Mario Musolino, means that fast food workers in New York City will see their wages increase $1.50/year over three years to a minimum of $15 an hour by 2018. 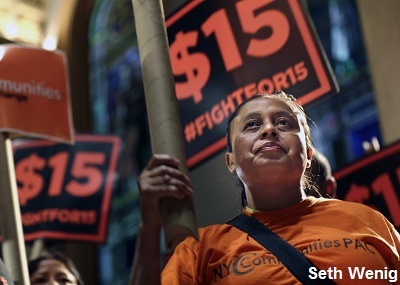 Fast food workers in the rest of the state will reach that amount in six years, by 2021. Such a raise will mean many hundreds of millions of dollars of increased wages for New York City workers, and hundreds of millions more for workers in the rest of the state over the next several years. It may seem surprising that “Governor 1%” Cuomo – who has been conspicuously supported by hedge fund managers – pushed for this change. But it reflects the real pressure created by the fast food workers’ movement which reached a new height on April 15 this year and of course the victories in Seattle, San Francisco and LA. 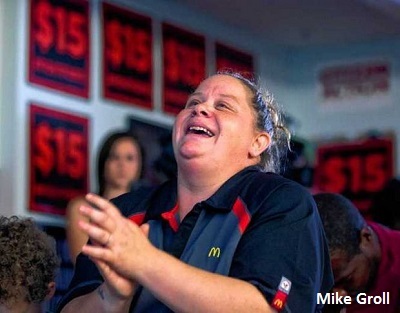 A national poll earlier this year showed that 63% of the population supports a $15 an hour federal minimum wage. Cuomo, who has national political ambitions, has simply recognized that some concession had to be made in these circumstances. While this is a very significant victory, there are some real limitations as well. First, the change only affects one section of low paid workers, namely those who work in fast food restaurants with over 30 stores nationwide. Workers employed by small restaurants and bars and even those working for local fast food restaurants, performing exactly the same kind of work, will not see any increase to their wages. Secondly the proposed wage increase is not upwardly pegged to inflation after $15 is reached. This means that, without future increases or indexing, any gains will be eroded over time as the cost of living increases. There are also long phase-in times before the full raise is reached, three years in New York City, and six in the rest of New York State. Given the super profits made by fast food corporations there is absolutely no reason for any phase-in and it simply means poverty wages for several more years for fast food workers and their families. Such a long phase-in will especially affect women and people of color, since both groups are vastly over-represented among fast food workers. Despite the limitations, the wage board decision remains a huge step in the right direction. However, it should not be seen as the end of the struggle but as a springboard to keep fighting for those workers who have been struggling to make ends meet for decades and need relief now. 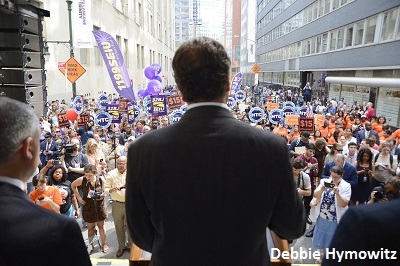 The vast majority of people in New York agree that all workers deserve a living wage. If the current minimum wage—a paltry $8.75 an hour—is too little for fast food workers to live on then it is also definitely too little for retail associates, janitors, crossing guards, and home health care workers. If fast food workers deserve more for their hard work, so do the incredibly hardworking dishwashers and cooks who work in the state’s many thousands of small restaurants and bars, or the car washers or factory workers who toil for less than $15. 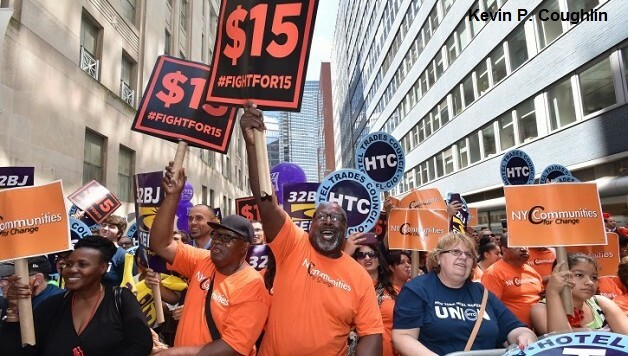 The workers of New York need to use the momentum of this victory and the example of the courageous fast food workers who started this struggle in 2012, to keep the movement going to win a $15 an hour minimum wage pegged to inflation for all low paid workers and with no phase-in for big business. We should be clear that, in New York City particularly, a $15 wage really is a bare minimum for workers who face some of the highest rents and cost of living expenses in the nation. As Ben Casselman has noted, adjusted for the cost of living, the actual value of $15 an hour in New York City will be only $11.27 in today’s dollars by the time it is implemented, compared to $14 in some upstate areas. Therefore, it is imperative in our struggle for a minimum wage in New York State that we also fight for home rule legislation, endorsed by the City Council and Mayor de Blasio, that would allow New York City and other municipalities to set their minimum wages above the state level if they choose. Such a further raise would not only vastly improve the lives of millions of people in the city, but would also bring billions of dollars into the City’s economy each year. With the state legislature currently deadlocked between a Democratic Assembly and a Republican Senate, further victories will be impossible without a continued and determined mass movement for $15. To win, such a movement will have to take to the streets, fight alongside other groups such as Black Lives Matter, and keep its eye firmly fixed on the goal of universal racial and economic justice.